Used motor oil, like other household hazardous waste (HHW), can have a lasting negative impact on the environment. Used motor oil from just one oil change can contaminate a million gallons of fresh water – a year’s supply for 50 people. It’s insoluble, persistent, and contains toxic chemicals and heavy metals. Luckily, used oil can be recycled over and over again and saves energy and other resources every time. Used oil filters can also be recycled for the oil that remains inside as well as the steel. Tekla Balukas, our outreach manager and avid motorcyclist, at The Legendary Sacramento Mile. But why target motorcyclists? It turns out they are more likely to change their own oil than the average car owner and will often change the oil on their other vehicles as well. Riders Recycle’s goal is to increase awareness and improve used motor oil and filter recycling among Do-It-Yourself (DIY) motorcyclists. You will find our in-person outreach team at many events throughout the year (especially in the spring and summer). We also get the message out through our Riders Recycle website, social media channels and geo-targeted digital ads. Along the way we’ve learned some important lessons. Credibility is an important factor in any community, but it’s critical with motorcylists. From cruisers with Harleys to dual-sport adventure riders to dirt bikers and more, motorcylists are quick to notice if you’re not one of them. With several long-time motorcyclists on the Riders Recycle team, they know the right language and tone to use with each of the diverse motorcycle groups. As our team develops better relationships with event promoters, motorcycle retail businesses, race organizers, and off-road-vehicle organizations, we’re able to connect with new motorcycle communities. No matter the audience, it’s important to choose messengers who look like, sound like and ideally come from the communities that you’re trying to reach. A Stanislaus County motorcyclist using our free oil change recycling materials at a Frank Raines OHV Park event. Because our team “speaks the language” of motorcyclists, they’re able to build trust and encounter more receptive attitudes towards the oil and filter recycling message. Even with the aversion to “environmentalist” and “government” messages in some of the motorcycle communities, when our outreach staff take the time to listen to concerns and emphasize common values, most DIYers open up to change, no matter their initial stance. With off-roaders, the message works best when recycling is positioned as a responsibility to the land, community and access for future generations. Efficiency-motivated riders are excited to learn about the technicalities of the oil re-refining and filter recycling processes. It’s wort it to take the time to understand your audience and test language to make sure it resonates with them. More complex behaviors like oil and filter recycling can benefit from in-person outreach that allows for longer conversations. While social media and digital ads help to reinforce the message, they aren’t always enough for behaviors with several barriers like recycling used oil and filters, reducing food waste or stopping illegal dumping. With in-person outreach, you can communicate why, how and where to do the behavior, give out tools to make it easy, and encourage community ambassadors. The Plastic Free July campaign uses norming and pledges to encourage behavior change. I just completed my second Plastic-Free July! This is a worldwide event that draws attention to the enormous, and enormously damaging, place that single-use plastic holds in our daily life. While a single person’s actions may not seem to make much impact on the 8,000,000 tons of plastic that enter the ocean each year, we’ve got to start somewhere! And, it is possible to draw some lessons from the month-long discipline to help us think about behavior change. As with any behavior change, it’s important not to punish yourself – or your target audience – if /when you fall off the wagon. I searched and searched for a non-plastic toothpaste tube, to no avail. I finally found a glass jar of toothpaste in a homeopathic shop. Yes, it had a plastic lid, but I decided the compromise was acceptable. And I got used to the taste! In our campaigns, we avoid showing super heroes – because the behavior change we are after doesn’t require super powers to do the right thing. “Regular” people can make a big difference. We steer clear of messages like “Can you get all your waste for the year into a peanut butter jar? No? What’s wrong with you?” Instead, we try to make the desired behavior attractive and achievable. Supermarket shopping gets a whole lot faster when single-use plastics are off limits. Entire aisles of cookies, chips and crackers are forbidden to the plastic avoider. How relaxing! I can avoid temptation and adhere to good plastic-free consumption and nutrition habits at the same time. Freedom is an important value in the American psyche, and is one that environmental campaigns may be able to take more advantage of. Taking a restriction (reducing use of plastic or pesticide or water, for example) and reframing it as freedom can be an effective behavior change message. Think Before You…Do, Buy, Cook, Toss! While I have not been able to stay completely plastic free, the search for alternatives to plastic is starting to become a comfortable behavior, and is making me more aware of things I take for granted. Carrying my work into my life, and vice versa, is very rewarding. Sunnyvale’s FoodCycle Branding and Video — A CAPIO Award Winner! 4) How to dispose of the kitchen waste in the new curbside cart. This approach differs from other food scrap outreach that emphasizes what kinds of food are accepted. Instead, the model “FoodCycles” in situations when food waste is generated: cooking/prepping food, cleaning up after meals, and cleaning old leftovers out of the fridge. We’re proud to say that the video won the Epic Award of Distinction in its category at the California Association of Public Information Officials (CAPIO) annual awards competition in April 2018. Lisa will be trying a new approach to reducing the large amounts of food waste related to raising her 11-year old son, Jackson. On most days of the current school year, he returned home with an entire lunch uneaten. Applying barriers and benefits research, she talked to Jackson about why it was happening. Barriers included forgetting—he was playing with friends instead of eating—and not finding the food appetizing after it sat in his lunchbox for 3 hours. “Like all moms I worry if my child is eating enough. But the waste is troubling me. In 2018 I’m going to let Jackson choose to purchase the school lunch if he is hungry. We gave him a watch with an alarm to remind him to eat. And to address my worry, I’ll send along a non-perishable snack in case of emergency.” A pilot test run demonstrated that Jackson chose the school lunch every day, so the new year is already looking food-waste free! Kas is back in the saddle this year – bike saddle that is. She starts training in January for the AIDS/LifeCycle; she will ride her bike from San Francisco to Los Angeles during the first week of June. Kas often spots litter and illegal dumping on her Bay Area training rides. Sometimes cyclists themselves are the cause of litter with items that fall out of their overstuffed jersey pockets or, worst of all, those cyclists who purposely discard wrappers along the way. Kas pledges to pick up what trash she can and/or report illegal dumping through the See Click Fix app on her phone… and if by chance she can catch up to someone who has littered, she will take a moment to “educate” them on the finer points of leaving nature better than when they found it. Stef continues her efforts to create a backyard wildlife refuge, in spite of some setbacks in 2017, including relentless weeds and an infestation by some very hungry, non-native caterpillars that killed all 18 bush lupines. “After countless hours of weeding and hand cramps from spraying infested plants with soapy water, the promise of a quick fix with pesticides looked pretty darn tempting,” she admits. But fearing the pain of cognitive dissonance if she were to use chemicals in her all-eco yard, Stef pledged to apply more elbow grease instead. She’ll put down her third layer of sheet-mulching and is set to crowd out weeds with low-water, bee-feeding, bird-harboring California natives early this spring. We wish everyone a Happy New Year and pledge to work with you for a cleaner, greener 2018. Please let us know if we can help with your environmental behavior change campaigns. As we work on environmental behavior change campaigns, we spend a lot of time crafting the perfect look and wording – to get the message right. Choosing the right messenger for that message is essential for its success. The Gigantic team’s presentation at the 2017 California Resource Recovery Association Conference covered several aspects of thinking about the best messenger. Mascots have the power to attract and engage people and make them care about issues such as recycling, waste or water quality. Creating and implementing a mascot messenger takes planning, patience and creativity. We presented examples of recent environmental mascots and talked about the process for creating, naming, scripting and distributing a mascot. A message is easier to accept if the viewer identifies with the person delivering the message. Our presentation touched on how to evoke thoughts like “Well, if she can do it, so can I” or “I want to be more like that person” in an environmental campaign, by recruiting community members to deliver the message. It’s easy to treat social media like another advertising channel for promoting your organization’s events and campaigns. But social media can be so much more than a digital bulletin board. We looked at ways to establish a personality on social media that doesn’t just tell folks what to do, but that interacts, observes, and participates in the broader online community. One excellent example is Baltimore’s Mr. Trash Wheel, who demonstrates best practices for tone and engagement. Here is the CRRA presentation covering the above topics. Please let us know if you have questions or would like to talk about how the right messenger can work for you. Expressing gratitude for change is important. At Gigantic, we work hard to “get inside the heads” of the audiences we try to reach. How difficult is it to get someone to change behavior, even to be aware of that behavior? I experimented on myself last month, when I joined the #PlasticFreeJuly movement, and tried to avoid buying or accepting anything made of plastic for 31 days. The first thing I noticed was anxiety, and a tendency to over-compensate. Should I stock up on plastic on June 30 so I could get through the month comfortably? What would I have to give up? Just how uncomfortable is this change going to be? How can a behavior change specialist address her own fears of change and scarcity? My first day was a failure, but also a tremendous success. I went out to lunch and ordered a cocktail (it’s OK, it was a Saturday!) The drink came with a straw – I had forgotten to ask for no straw. Disaster in the first few hours of the experiment! I posted about my personal failure to Facebook and Twitter, tagging the restaurant. I was amazed to see several supportive comments, even from “non-green” people with whom I had not interacted in years, saying they, too, were sick of plastic and that I should keep trying. Then, lo and behold, the restaurant responded to me via Facebook, saying that they, too, loved this particular cocktail and from now on would serve it without a straw. Victory! I took away from this experience that it can be more effective to post about one’s own weakness, to acknowledge error, rather than trying to be a brave and mighty eco-hero. Challenges kept on coming throughout the month. In some cases there were joyous substitutions – I discovered that bread sliced at the bakery and wrapped in paper did just fine in the freezer, so breakfast was set. As the month wore on, I realized that plastic equals convenience, and that I had to re-align my idea of what was convenient. Yes, it takes longer to bring your own containers and use the bulk bins of the market. It takes more effort to go to the cheese shop where the owner was happy to wrap my slices in paper – not an option at the supermarket. On the flip side, I had wonderful conversations with folks behind the counter; some were bemused by my requests, some were delighted. But this was an opportunity to connect with people in my neighborhood whom I had, frankly, barely noticed before. How to translate this greater feeling of community to our work? It’s August now, and I have relented a bit, but the plastic-free exercise has stuck with me. The main thing I took away from July was a heightened awareness of plastic’s never ending presence in our lives. Entire aisles of the supermarket were off limits – which after a while felt quite restful. Connecting this ubiquity with the fact that of the 8.3 billion metric tons of plastic ever made, 6.3 billion metric tons have become plastic waste, with no end in sight. After this experiment, I am reminded as we plan campaigns that in many cases we are asking people to change, to give up something, to be inconvenienced. These are big asks. While these changes seem essential and even joyful to those of us in the environmental field, I believe it is essential to integrate humility and understanding into our campaigns, so that people feel understood and supported as we travel together on this journey to more sustainable living. Effective environmental behavior change—like any behavior change—relies on meeting people where they are. This can mean communicating at the point of action, right where and when the behavior is happening. For instance, a recycling flyer sent to a resident’s home is a fine first touch to raise awareness, but placing recycling information directly on the bins or in the area where trash is being disposed of is an important prompt that is likely to get the best results. Do you say Carts or Bins? Compost or Organics? Make sure the terms you’ve chosen are used consistently in all your print pieces, including posters and bin labels, and also match the content on your website. Different people learn and remember differently – some people recall words, others, images. Using both will increase your chances of being clear and memorable. Remember that posters are typically viewed from a some distance away, so make sure images and text are sized large enough. 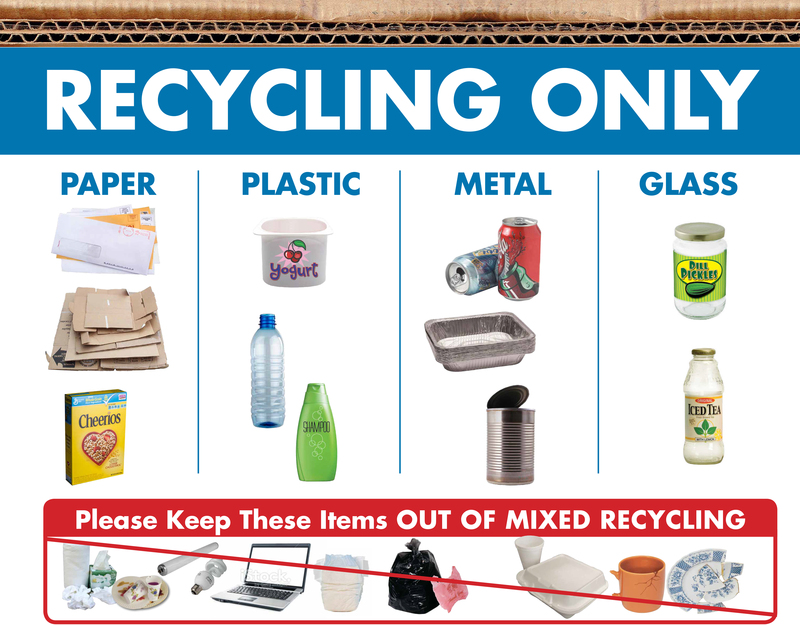 You probably don’t want to list EVERY single item that can go into the recycling or compost. Choose most common items or those often placed incorrectly. The selection of items also depends on where the poster will be used—items recycled in an office are likely different from those recycled in a restaurant kitchen. A clean and simple layout is most likely to keep the focus on proper sorting. If a poster has too much information it may be perceived as too much effort to understand and get ignored. If you’d like to point to details, include your website URL prominently. Did bin colors change with the new hauler contract, or are you now accepting some items for recycling that you weren’t before? Make sure your print and online collateral match your current program.